The Humidors are in their element and absolutely rage on stage. Bursts and washes of B3, punchy horns, chugging percussion, thumping bass, and burning guitar leads all interweave in an infectious polyrhythmic stew. This band of troubadours has developed a sound that pulls from a melting pot of old-school and modern influences, yet is always rooted in a big sound, high energy ensemble approach to funk that builds it's grooves with psych-Rock-Soul layers and super rhythms one on top of the next ... Pure Magic Music! Hailing from the Bay Area, The Humidors have been churning out their own unique brand of party music for half a decade. Combining elements of hard-hitting funk, greasy soul, vintage R&B, soul jazz and more you can be sure that this eight-piece unit is committed to the groove in all its shapes and forms. With the recent addition of Andre Cruz's soulful and heartfelt lead vocals, The Humidors are taking their music to the next level and ready to spread the Gospel of Funk to dance floors everywhere. Having shared the stage with acts such as Dumpstaphunk, ,The Nth Power, The New Mastersounds, The Meters' Experience, Shuggie Otis, and the late, great Bernie Worrell, The Humidors are in their element on stage. Bursts and washes of B3, punchy horns, chugging percussion, thumping bass, and burning guitar leads all interweave in an infectious polyrhythmic stew. Oakland’s Hammond-heavy instrumental quartet, The M-Tet, is quickly becoming Northern California's go-to band. Having recently opened for Lee Fields & The Expressions, The Sugarman 3, Monophonics, and Matador! Soul Sounds (members of The New Mastersounds, Soulive, and Pimps Of Joytime), The M-Tet shows no sign of stopping. 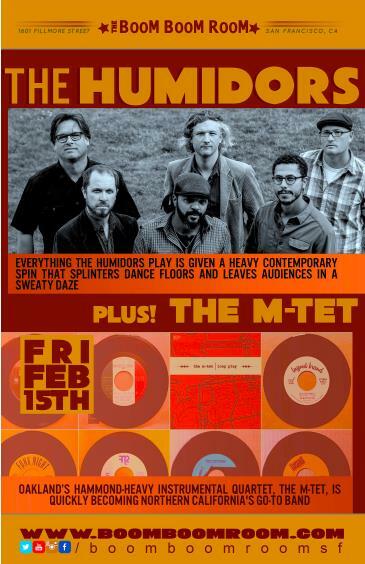 The M-Tet is a neck-deep study of late-60s organ-based R&B bands such as The Meters, Jimmy McGriff, and Booker T. & The MGs, as well as the modern soul heroes of today, Sharon Jones & The Dap-Kings, Charles Bradley, and Poets Of Rhythm. 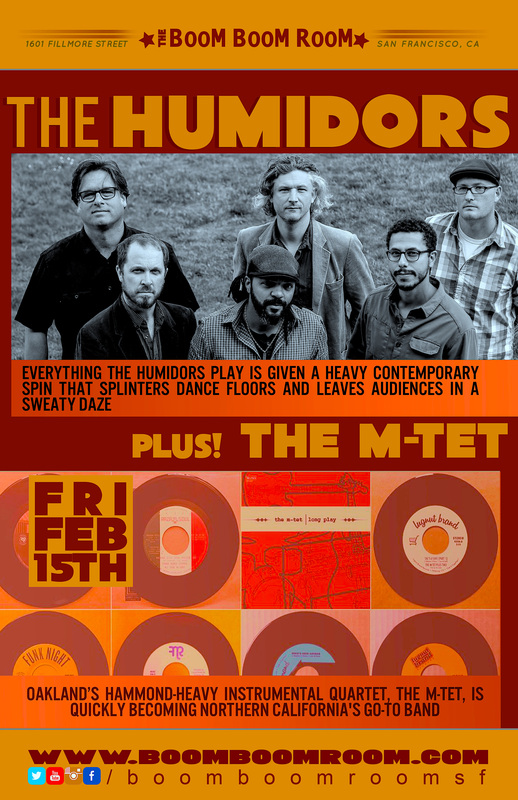 With their modern take on a classic sound, The M-Tet is just as much a dance party as a statement of how an old-school approach to raw, honest, unedited music is here to stay, with most of their music recorded live to tape. Since their inception, The M-Tet has been releasing a string of smash 45s, collaborating with labels around the country, including Detroit’s Funk Night Records, San Jose’s Raza del Soul, Kansas City’s Sunflower Soul, and the East Bay’s Lugnut Brand Records. With another 45 on Funk Night Records, the Monophonics-run Transistor Sound label, and their upcoming sophomore album “Total Nonstop Action” scheduled to drop in 2018, their catalog is ever expanding. In addition to playing at legendary San Francisco area venues such as The Great American Music Hall, Sweetwater Music Hall, The Mystic Theater in Petaluma, and the landmark Boom Boom Room, their upcoming dates expand across the country. With shows on the calendar in Boston, Detroit, New York, New Jersey, Chicago, Los Angeles, and high profile date at San Francisco’s SFJazz, 2019 is shaping up to be their biggest year yet.